I've recently taken a shine to Shaymin and am thinking of starting a mini-hedgehog!min collection. However, size is very much an issue to me, so I'd like to know your recommendations. I've looked at pokeplushproject, but small, medium-small and medium really isn't any indication for me, especially since the plush aren't photographed next to objects that can be used to estimate their size. The Landmin plush(es?) I'd like to get, eventually, should hopefully be around the size of MPC plush, so that they won't take up too much space. If you own any of these plushes, could you tell me what these plushes are made out of? or if you're not sure, could you describe how the plush feels? soft? rough? (as well as their approximate height). I searched y!j for shaymin and right now the likeliest candidate looks like this one... is she a canvas plush? By the by... are videogameforless and dvdking888 legit ebay sellers? 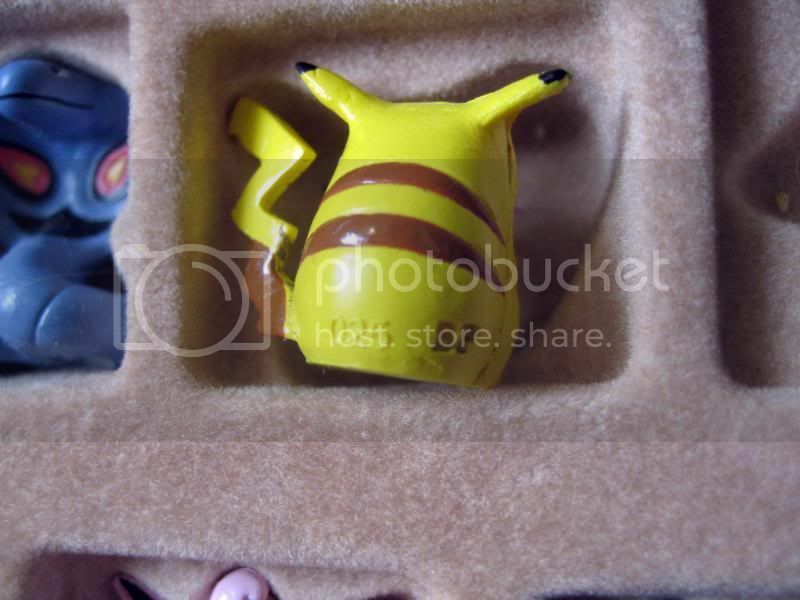 Since I keep seeing an explosion of metal figure GA's and the like, I was wondering if maybe I missed this elusive pikachu figure. I first saw it from Feraligroggles...does anyone else have it? 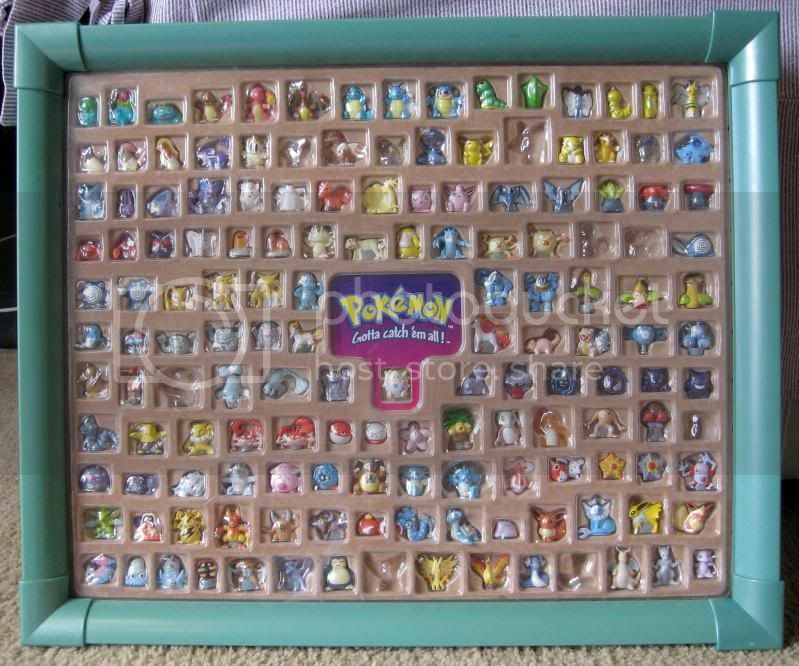 I want everything on here, but mainly I want that sleepy pikachu...preferably in that color as well. Help a sista out! hello guys <3 i come with a question <333 so lately me and my brothers friend have been arguing over facebook about this card he has. He says its a 1996 first edition holo base set charizard (pretty sure he ment 1998 tho >.>) and keeps telling me its worth 2,000$ - 2,500$ (according to a Yahoo article) but when i look online i see them selling for like 30$ (lol) and i saw one in a card shop on November 2nd for 40$. im pretty sure the 2,000$ one is the SHADOWLESS one, but i've never seen his card to look at it, and even if it is, the ones on ebay sell for about 300 - 400$. the nearest card shop for me to ask at is over 50 miles away so i figured i would ask on the community. 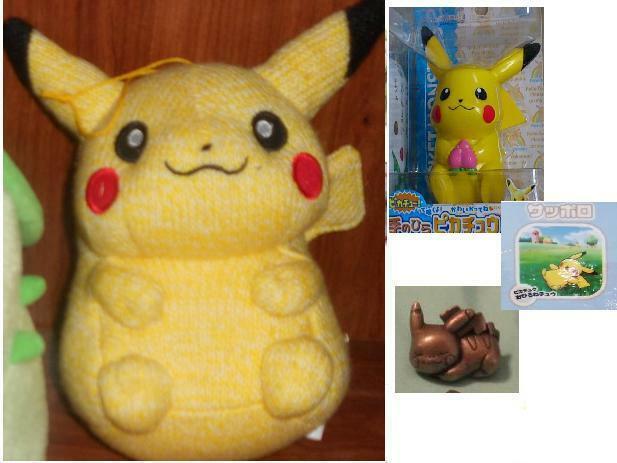 Hey everyone, I was thinking about buying a couple Pokemon items from an ebay seller, but am not sure if the items are legit or bootleg. The seller is happybaby2811 and here are a couple of their items. Hi guys! I'm still wanting a whimsicott Pokedoll and any loose pokedoll tags you might be willing to sell! Whimsicott doesn;t have to have a tag, but it'd be nice if it does =) Thanks! Looking for this canvas still, Please any and all help would be appreciated :) and just to clairify I have already checked eBay and Y!J. No luck on Y!J and trying to spend less than or close to $200 lol. This will be a boring post, but today I bring you some card sales! The big card in here being a full art Bianca! I had posted these a few times a couple months ago with no luck, so I thought I'd try again! I only need three more figures to complete this! I'm hoping to get them for about $2+shipping each, and they don't have to be mint. If you don't want to let it go for that price, throw me an offer! No idea what to offer, but I do want the complete set. Desperately. I need these Chu's in my life! edit: Found a full set on eBay! Much squealing, screaming and bouncing later, it has been bought and hopefully will be on the way soon! Also, my husbands favorite Pokemon is Corphish, so I'd like to get him a couple things for Christmas. The only things I know of are the kid and dex figure, and a plush. I don't want to spend a lot of money on these and they don't need to be mint, since he isn't a collector and they'll be little stocking stuffers. Not really looking for flats. we won the AGOGO GA! !, we also go some pretty impressive discounts! please edit the spreadsheet saying you have paid please. in the note please leave your username and what you brought. please make the title "GA agogo payment 1" I am currently running another GA so would like to keep them in order! So I have some custom Haunter plushes, custom Sabrina plush, Shiny kid and some ghosty flats! I also have Japanese cards up for auction! Click the image above to go to the auction! Hi, fellow community members. Today I came with a list of wants. And with a great satisfaction, I have taken two of them off the list! Yay~~~ If you have any one of these, please throw the offer to me, and I will pay you with a decent price. I am also fine with do trades. I have a lot of Full Color Stadium/Collection figures and Battle Museum figures in my hand right now. Dragonair is the high priority. Altaria only. And I am also searching for Swablu but did not even find a picture of her. Does anyone own one? If all of these die out, I am interested in buying a Serperior pokedoll OR Zapdos zukan. I can offer $40 before shipping and at most $45 shipped. That's all. If any of the pictures is yours and you want it to be taken down, please let me know. Sorry about that. Secondly, is there anyone interested in BW Retsudem Stamp set 5? I am thinking of doing a group buy by ordering from Amiami. But I am not sure if there are enough stamp lovers for it. Here is a picture taken from schenzi. I do want a stamp of Serperior. Ok. I have decided to take a first try to group buy these. General rules below. Please read and comment if you are feeling confused. Sales permission granted by denkimouse on January 28th, 2011. I ship from United States. I do ship internationally. There will be two payments. One for paying items plus shipping (edit: plus pp fee) from amiami to me. Second for paying shipping, material, and pp fee from me to you. You must pay your part within 48 hours when each invoice is out. I am not sure to choose which shipping option. Generally EMS will be the most expensive one, but it is insured and take 3-5 days. I am pretty sure it will cost 1500 yen for this option. Airmail small packet is the second fast shipping method, and will take usually 1-2 weeks. 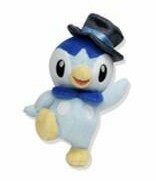 (I believe Gin used this to ship Pokemon Time Plush) SAL will be the slowest shipping method, and I will doubt if it is applicable to choose this option for a group buy. So please comment below which one you think will be the best option. I will choose EMS as a shipping method. This set of stamp is sold for 1320 yen on Amiami. So I assume that the base claim price will be that equally divided by 18 and converted to US dollar. So each stamp will have a claim price of $1. I will claim Serperior for $1. All claimed! I will place an order and please prepare for your first payment! Thanks guys. Payment #1 is calculated in this spreadsheet. It includes item price and international shipping from Amiami to me. Please go ahead to check your due and pay by following just several simple steps. If you are in the U.S., pay the amount shown in column F, otherwise pay the one shown in column G.
In the note, please put your community username and what you won in this group auction. Better sent via your computer instead of mobile phone because it may make me unable to see your shipping address. Mark you off as paid by leave a note in column H next to your total. I will leave away from my computer to finish my homework. If you have any problem, please make a comment in this post, and I will respond to you when I am back. Thank you very much! Hey everyone, just wanted to say that I've created a permanent wants post! Mostly Piplup stuff, with some Treeckos, Glaceons, and misc. pokedolls as well. Please check it out! If anyone has one or has seen one, please let me know! Well, that's about it for me. I hope you all are enjoying Eevee madness, I know my wallet has been taking a beating. I've gotten a bunch of new stuff but have a lot more on the way, including all of my new Glaceon stuff... I plan to post a collection update once everything arrives! Hey everyone! It's me again! I've recently became more active again on the community, I'm also going to be using my personal LJ much more! I've made a permanent wants post on there now, which i'm going to use from here on to post wants, since it's easier and quicker to update, and much better to keep on top of it! If anyone noticed what i put before about sorting out my Collection/Toy room, i've came to the point where i must once again weed collections down. My Snivy line Plush & other bits and bobs are going to be up for sale once this Eevee Madness dies down! I'm really excited about sorting my room out though. Since it houses 99% of my collection, but in a really jumbled way at the moment! I have the vision so clear in my head how i want it, has anyone else had a similar vision they can't wait to get done? Well, this is a post I definitely didn't think I'd be making. UPDATE: Apparently no one knows what these are... I'm going to send a PM to the seller and ask about any info they may have (what other plush were in the set, where they got them, etc. ), and I'll let you guys know what they say! Maybe they're rare, maybe not! But it sure is interesting, isn't it? I don't see these anywhere else online.